At the Southern Dominican Province Gala, Prior Provincial Fr. Thomas Condon, O.P. (right) presented Brother Roger A. Shondel, O.P., with the St. Martin de Porres Award for his lifetime of recognizing the spiritual needs of the New Orleans community. A native of Indiana, Bro. Roger entered the Dominican Order in 1962 after graduating from high school. In 1964, he professed his simple vows and made his solemn profession of vows in 1970. During his early years in the order, Bro. Roger, an accomplished tailor, made the Dominican habits for his community. 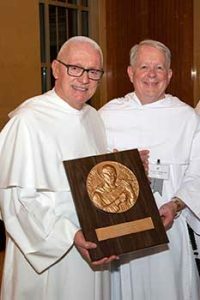 As a Dominican Friar, he has served in the field of education for nearly 50 years, counseling and educating students in Illinois, Texas and Louisiana. Bro. Roger has a Masters of Education in Guidance and Counselling from Loyola University Chicago, and is a National Certified Counselor and a Licensed Professional Counselor. At St. Mary’s Dominican High School, he has served as a guidance counselor for the past 35 years. Reflecting on being an award recipient, Bro. Roger shared, “To be listed among past recipients such as Gayle and Tom Benson, Archbishop Gregory M. Aymond, Harry Connick Sr., and Harry Connick, Jr., to name a few from the past 30 years, certainly humbles me. “This great honor named on behalf of St. Martin de Porres, Patron Saint of mixed race people, public health workers, and all those who seek racial harmony, and the Patron Saint of the Southern Dominican Province, reflects what it means to be a person of perseverance, patience, happiness and joy. St. Martin de Porres certainly exemplified all of these qualities. He was a man of great humility, who righted wrongs and injustices whenever confronted by them.